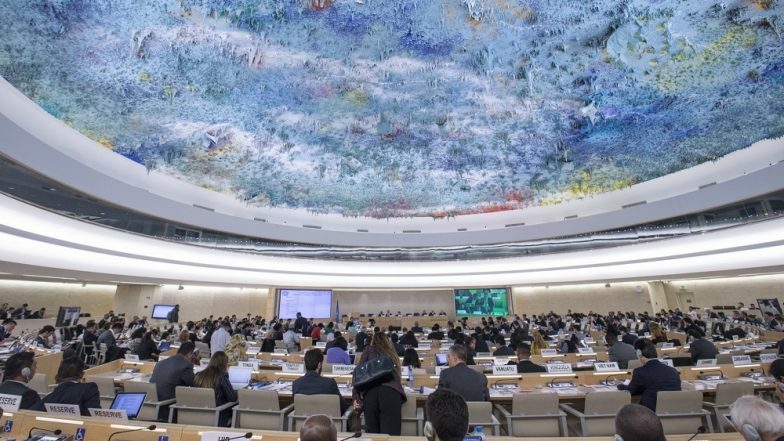 Geneva, March 25: Indian student Wonder Nayal, who spoke at the UN Human Rights Council here last week on the Sri Lankan Civil War and the time given to the island government to investigate war crimes during it, feels that one shouldn't wait for a title or an occupation to initiate change. Nainital-born Nayal, 18, was representing a non-profit organisation Jeunesse Etudiante Tamoule (French for Tamil Youth), which aims at educating the international community about war crimes against the Sri Lanka Tamils and their struggle for justice. Four years into a 2015 UNHCR resolution to address human rights issues, the Council last week had approved giving Sri Lanka two more years to set up a credible war crimes investigation into the decades-long armed conflict that ended in May 2009 with the killing of LTTE supremo V Prabhakaran and his family. Nayal, who made a brief speech at the Council, noted that the "conflict is estimated to have killed more than 1,46,000 people in Sri Lanka." India and Pakistan Clash at New Session of UNHRC in Geneva. "About 80,000 people, mostly Tamils, are thought to be missing. Over a million people are displaced from their homes due to military occupation of Tamil areas," she added. "Though the Sri Lankan government has taken some measures, Colombo has fully implemented only six out of 36 commitments made by the government in Resolution 30/1. "Keeping this in mind, if the Sri Lankan government is unable to comply with the rest of the resolution in the coming two years, the international community would have supported 12 years of injustice to the Sri Lankan Tamils." Actively involved in social work after school, the young law aspirant told IANS that she feels "the world should be equal and everyone should have a certain standard of living". "The problem is that the international community has decided to give Sri Lanka two more years. Few measures have been taken by their government yet, but they do not have much support from the victims themselves. "What I also spoke about was that they should look at alternative ways of helping the people if these two years are not able to bear more results," she said. In her speech, Nayal had also stressed that the international community could consider "mounting pressure on Sri Lanka if they are unable to fulfil their commitments in the next two years". Though not directly involved with the victims, the young Pune-based girl also wants to "save up money" to work on human rights issues in Sri Lanka. Citing hearing of European students protesting against climate change a few days before her speech, Nayal maintained that "we shouldn't wait for a job, a title or an occupation to start helping the world. "We should take the opportunity and time we have right now and make our voices heard."